90-245V AC input with 16.5V DC 1.0A Output for 12 Volt cells. Intelligent Lead-Acid Battery Charger provides current to battery set at correct amount to charge without overheating, shut off when batteries are charged. Choice of connector, XLR male or standard female. Replacement for the more expensive OEM X-10 Lead-Acid Battery Charger or OEM X-140 Lead-Acid Battery Charger, this Intelligent scooter Lead-Acid Battery Charger automatically charges batteries at a rate that will not damage batteries and shuts off to prevent overcharging or charger failure. Same 3.5mm single pin connector as used with X-10/X-140 Scooters, but less expensive. May be a suitable replacement charger for Sharper Image and Izip 130 using Lead-Acid batteries, too. Intelligent charger provides current to battery set at correct amount to charge without overheating, shut off when batteries are charged. Indicator light shows charging and when charged. WE NOW SHIP THE 24 VOLT 3 PIN CHARGER WITH THE MATCHING 3 PIN MALE SOCKET BECAUSE THE 2 PIN X-TREME X-11 OEM CHARGER IS NO LONGER AVAILABLE. The socket easily installs in place of the old 2 pin socket and still uses only 2 of the three pins. 90-245V AC Input Voltage with 29.5V DC 1.6 Amp Output for charging 24 volt battery sets. Use with all 24 volt, 3 prong scooters with either standard female connector or XLR Male Connector ready to use. This charger is superior to most scooter chargers because it has a fuse that can be changed inside the case if blown due to overload or accidental short. If your socket is different on your scooter it can still be used by replacing the socket with one of ours available here. Charger indicates red when charging and green when fully charged. May be used with two prong Battery Charger connectors by using the old two prong plug from the previous Battery Charger. Only two of the three pins are used in three prong chargers (pin 1 is always positive). 100-240V AC Input with +24V DC 1.6 Amp Output. OEM Brand 24 volt, three pin Lead-Acid Battery Charger as used on many Scooters including Schwinn, Mongoose, GT, and Currie. Charger with indicator light shows when charging and fully charged. Matches socket below. 90-245V AC input with 29.5V DC 1.6 Amp Output for 24 volt battery sets. Use with AC oulets in Europe only (American version above). For all 24 volt, 3 prong scooters with 3 pin male sockets. This charger is superior to most sold scooter chargers because it has a fuse that can be changed if blown due to overload or short. The case can be opened, unlike most others, and the fuse replaced. But if your socket is different it can still be used by replacing the socket on the scooter. Charger indicates red when charging and green when fully charged. May be used with two prong Battery Charger connectors by using the old two prong plug from the previous Battery Charger. Only two of the three pins are used in three prong chargers (pin 1 is always positive). Use with all 24 volt Lithium Battery sets, 3 prong scooters with either standard female connector or XLR Male Connector, ready to use. DC 2 Amp Output. This charger is made for Lithium Ion battery set charging only. Fan cooled. 90-110V AC input with 42.6V DC 1.6 Amp Output for 36 volt battery sets. Same charger as used on some X360 Scooters when 3 pin female connector is selected in the drop down menu. 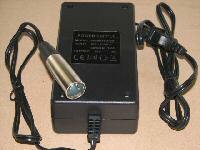 36 volt, three prong Lead-Acid Battery Charger with either standard female connector or XLR Male Connector, connected and ready to use. Charger with indicator light shows when charging and fully charged. May be used with two prong Battery Charger connectors by using the old two prong plug from the previous Battery Charger. Or purchase the three prong socket for replacement to match this Battery Charger connector. Intelligent Lead-Acid Battery Charger provides current to battery set at correct amount to charge without overheating, shuts off when batteries are charged. Indicator light shows red during charge, green when charged. WE NOW SHIP THE 36 VOLT 3 PIN CHARGER WITH THE MATCHING 3 PIN MALE SOCKET IN PLACE OF THE 2 PIN VERSION BECAUSE THE OEM 2 PIN CHARGER IS NO LONGER AVAILABLE. The socket easily installs in place of the old 2 pin socket and still uses only 2 of the three pins. 36 volt OEM Brand Lead-Acid Battery Charger, three pin plug choice, as used on many Scooters including some X-treme Models, MX500, etc. Charger with indicator light shows when charging and fully charged. Matches socket below. 90-110V AC input with 41.8V DC 1.6 Amp Output for charging 36 volt lead acid battery sets. Intelligent 48 volt, three prong PC Style connector plug, Fan Cooled, Intelligent Lead Acid Battery Charger with 90-110V AC input and 53.5V DC output (for 48 volt battery set) and up to 3 Amps Output. Charger with two indicator lights show when charging and fully charged. Standard polarity for most scooters (XB-508 and other discontinued lead acid battery scooters) OR the Polarity for Pantera scooters: Standard Polarity (N=Positive, L=Negative) where the PC style plug is marked with N and L at the connectors, Panterra Polarity (N=Negative, L=Positive). Charger Indicator pictures for charging and charged state. Intelligent 48 volt, PC style connector plug (matches the sockets on this page), Fan Cooled, Intelligent Battery Charger with 90-110V AC with 53.5V DC 2.5 Amp Output. Charger with two indicator lights show when charging and fully charged. If your socket is different it can still be used by replacing the socket on the scooter with the matching socket sold here, or by splicing or soldering on your old charger's plug. Intelligent 48 volt, three prong PC connector plug, Fan Cooled, Heavy Duty Lithium Battery Charger with 100-240V AC input. Charger with indicator lights show when charging and fully charged. Not compatible with LiPo4 battery sets. Intelligent 48 volt, three prong PC connector plug, Fan Cooled, Heavy Duty Lithium LiPo4 Battery Charger with 100-240V AC input. Charger with indicator lights show when charging and fully charged. Not compatible with LIMN Lithium battery sets. Intelligent 48 volt, three prong PC Style connector plug, For large electric scooters like the Panterra. Amperage output is up to 9 Amps. Fast charge use for Panterra (Freedom electric), Panterra (Fusion electric), Panterra (Retro Electric), and Various makes/models of electric scooters of different connection polarities. Fan cooled for heavy duty use, fuse protected. Pretested in load environment for a 48 volt battery set. Also, a standard scooter polarity version of this same charger for many brands of scooters using this type connector. Usual Panterra Polarity (N=Negative, L=Positive), Standard Polarity (N=Positive, L=Negative) where the PC plug is marked with N and L at the connectors. Intelligent 48 volt 9 amp, three prong connector plug, Fan Cooled Heavy Duty fuse protected Charger for large electric scooters. Amperage output is up to 9 Amps to reach a charge state fast to more than double the speed of charging batteries. Fast charge use for Various makes/models of lead acid battery electric scooters. Pretested in load environment for a 48 volt battery set. Choice of output connectors. 3.5mm Single pin female connector plug for x010 and other scooter Battery Charger inputs. 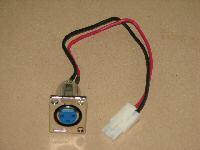 Rare socket for X-treme X11, X360 models and many others. Replaces the 3 pin male receptacle on the Scooter. Standard male 3 pin receptacle socket to receive the female three pin Battery Charger plug of most Electric Scooters including X-treme Scooters. Replacement for any make Scooter, may require splicing to your existing wiring connectors to your control box. Replaces the standard XLR receptacle on scooters. Replaces the standard female or male XLR plug on the Scooter Battery Charger cords. PC Style male 3 pin receptacle socket to receive the female three pin Battery Charger PC Style plug of most Electric Scooters. Replacement for any make Scooter, may require splicing or soldering to your existing wiring connectors to your control box. Usual Panterra Polarity (N=Negative, L=Positive), Standard Polarity (N=Positive, L=Negative) where the PC plug is marked with N and L at the connectors. We began selling tested parts at a discount, or wholesale scooter parts, to valued customers who are primarily repairing customer scooters. Testing each part is necessary to insure parts work properly, saving the need for time and money wasting returns. With our quality tested parts repair shops were quickly able to repair their own customers scooters, receiving the parts in a few days at a decent price. Our prices are lower for tested parts and scooters, and we may still be the only ones testing what we sell, including the battery chargers sold on this page from our warehouse. * Look over the battery chargers we sell on this page. We sell universal use battery chargers for nearly all scooters. All you need to know is how many 12 volt batteries are installed in your scooter to determine the voltage of the electrical system (two 12 volt batteries would be a 24 volt system). Most scooters use lead acid batteries, but some use Lithium. Chargers should always match the type batteries used. Our chargers are for Lead-Acid battery sets unless stated otherwise. * Find a charger that matches your scooter's battery electrical system 12, 24, 36, 48, or 60 volts beginning at the top of the page and scrolling down until you find a charger of the correct voltage (they are all standard AC input) for charging 12, 24, 36, etc output and the connector mates to your scooter charge receptacle. The most common charger plug is a 3 prong female type that mates with a three pin male receptacle, but other plugs are also used and pictured/described. * Note that battery charger output DC voltage is alway slightly higher than the system voltage so that, for example, a 24 volt charger would output 29 volts in order to charge the battery set of two 12 volt batteries connected together in series. With this information you should find a charger that will charge your batteries and automatically turn off when finished. * Electrical components are not covered by warranty for return to exchange or for refund. Parts are tested prior to packaging for correct operational condition.